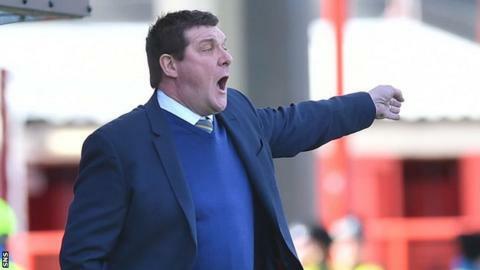 St Johnstone's Tommy Wright has echoed recent criticism of artificial surfaces used by clubs in Scotland's top flight. Two of the 12 Scottish Premiership clubs - Hamilton Academical and Kilmarnock - do not play on grass. "I fully understand why clubs have to do it," manager Wright told BBC Scotland. "It's all about money. For smaller clubs, it's a massive income. "But I don't think that, at the top level of the game, they are the answer - it's better to have grass pitches." Wright's remarks follow a weekend during which Hamilton defender Michael Devlin and Partick Thistle midfielder Ryan Stevenson suffered knee injuries on Accies' New Douglas Park surface. Dundee United captain John Rankin told BBC Scotland's Sportscene that artificial pitches should be banished from the Premiership. Wright, who is happy to have his players train on an artificial surface next to McDiarmid Park, believes the quality of artificial surfaces deteriorates too quickly. "We played on one last year and, if I was to mark it, I would give it 10 out of 10," he said. "We played on the same pitch at the start of this season, I would give it seven out of 10. We played on it later on in the season, I would have given it five out of 10. "It deteriorates and doesn't get back until you replace it." Wright thinks some clubs struggle to finance the maintenance of artificial pitches. "A lot of them don't have sprinklers in it," he said. "It's how often they are maintained and how much money is spent on the maintenance of them. "We played on one that was almost as if it was matted and the ball wasn't rolling - it was just bobbling along on it." However, Wright admits that clubs with grass pitches also have to spend more to maintain surface quality. "A grass pitch at the start of the season, they are all immaculate and they deteriorate throughout the season and then you repair them," he said. "It is a fine balancing act for clubs. What do they do? "Do they spend another £100,000 a year on the pitch or do they put it into the playing budget? I can guarantee that most would put it into the playing budget." Wright is envious of the quality of pitches in England's top leagues. "Look at the pitches in England now in the Premier League and the Championship because of the sponsorship and the money that's going into it - they are able to spend money on their pitches," he said. "If you go back 10 years, some of the pitches in the Premier League were as bad as some of the ones we're experiencing at the minute. "But there needs to be more investment in the game to allow clubs to spread the money around a bit more other than just the playing budget."